While not exactly a comedy, 50/50 tackles a distressing subject with a healthy dose of humour, thanks to a sharply observed script, well-rounded, likeable characters, astute direction and a trio of terrific performances from Joseph Gordon-Levitt, Seth Rogen and Anna Kendrick. Directed by Jonathan Levine and written by Will Reiser (who based the script on his own experiences), 50/50 stars Joseph Gordon-Levitt as Adam, a 27 year old radio journalist who's shocked to discover that he has a rare form of back cancer that has a 50/50 survival rate. As he struggles to come to terms with both the illness and his imminent series of treatments, he receives varying degrees of support from his artist girlfriend (Bryce Dallas Howard), his neurotic mother (Anjelica Huston), his best friend Kyle (Seth Rogen) and a pretty, inexperienced therapist (Anna Kendrick as Katie). 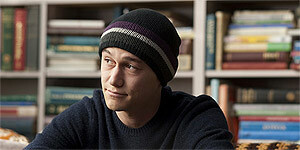 Joseph Gordon-Levitt is excellent as Adam, an easy-going, non-confrontational person who reacts to the devastating news by attempting to keep a lid on his emotions. Similarly, Seth Rogen is hilarious as Kyle, his outspoken best friend who helps out with medicinal marijuana and isn't above using Adam's cancer to pick up girls (but who clearly cares deeply for Adam), while Anna Kendrick is wonderful as Katie. There's also strong support from both Bryce Dallas Howard and a slightly under-used Anjelica Huston, as well as engaging turns from Philip Baker Hall and Matt Frewer as a pair of elderly cancer patients who become Adam's new friends. There's a strong ring of truth to Reiser's excellent script and the characters are extremely well rounded and believable, to the point where the humour feels natural and organic instead of a parade of scripted wisecracks. As a result, the various relationships and interactions are extremely moving and the decision to under-play the expected big emotional scenes pays off in a number of interesting ways, while the film also makes some effective points about how we treat people who are ill, without ever becoming preachy or sentimental. Levine's control of the material is assured throughout, striking a tricky balance between humour and powerful emotion and getting it exactly right. He also orchestrates several wonderful scenes, such as Katie giving Adam a lift home and struggling with inappropriate conversation (actually, every scene with Kendrick is delightful); Kyle confronting Rachael after he sees her at a gallery or Kyle allowing Adam to drive for the first time. Astutely directed and superbly written, 50/50 is a warm hearted, frequently funny drama that takes a refreshing approach to a serious subject and features terrific performances from a superb cast. Highly recommended.